The new Broadway-Sansome Apartments will occupy one of three sites that opened up near Chinatown after the demolition of the earthquake-damaged Embarcadero Freeway. On Oct. 17, 1989, during the warm-up of Game 3 of the “Battle of the Bay” World Series between the San Francisco Giants and the Oakland A’s, an earthquake rattled the area just south of the Loma Prieta peak of the Santa Cruz Mountains, registering a 7.0 on the Richter scale. The shaking lasted only 10–15 seconds, but it destroyed numerous sections of bridge and road and left thousands of San Francisco residents homeless. In a strange twist of fate, though, it also paved the way for future shelter. When the 1989 Loma Prieta Earthquake struck San Francisco, it hobbled the Embarcadero Freeway, which ran along the waterfront and touched land on Broadway Street. Locals fought to keep the freeway because it was seen as an important gateway to Chinatown, but they lost when the mayor and Caltrans decided to tear it down. Its land was divided into three building sites, originally meant for a hotel, a police station, and an affordable-housing complex. The CCDC was developing that complex, called the Broadway Family Apartments, when the San Francisco Police Department decided it didn’t need another station. The city then allocated that site for affordable housing as well, and in June 2007, the CCDC won the bidding process to develop the land, giving birth to the Broadway-Sansome Apartments. Construction began in April 2013 and is scheduled to end in January 2015. “It was the best the community could do out of a situation that didn’t work out the way the community wanted it to,” says Whitney Jones, the CCDC’s director of housing development. If any neighborhood in San Francisco needs affordable housing, it’s Chinatown. The district, centered at Grant Avenue and Stockton Street, has become the largest Chinese community outside of Asia since its establishment in 1848, and it’s known for its overcrowding and poverty. The San Francisco Planning Department has even deemed it the most densely populated urban area west of Manhattan, with 15,000 residents living in just 20 square blocks, their annual household income averaging $42,153, a little more than half that of the overall city average of $73,798. including an interior courtyard, a rooftop deck with seating, and a community garden. “That combination of features is pretty amazing,” Jones says. The challenge of developing affordable housing, of course, is keeping it affordable, and that has been a particular hurdle for the Broadway-Sansome Apartments, says Kim Piechota, project manager. The $32 million building is situated on a narrow, sloping site, and addressing the structural issues required to get the building into that footprint drove up costs. The building will also be GreenPoint-rated, the predominant non-LEED-based green home-rating system in California. Its eco-friendly features will include sustainable materials, low-flow plumbing fixtures, rooftop solar panels, and an underground water cistern that will slow storm-water runoff and, when filled, be used for toilet flushing. Per city requirements, the Chinatown CDC also added a separate plumbing system to its design that will eventually tie into a reclaimed-water system that the city is developing. “It was not inexpensive,” Piechota says. 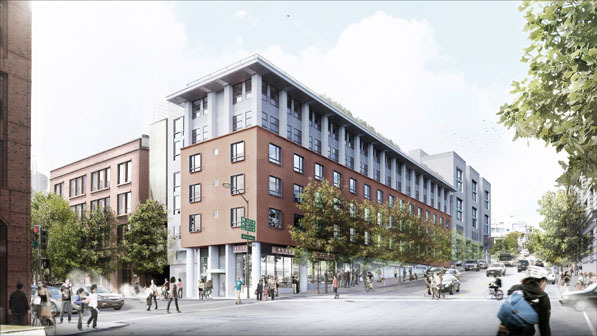 Given the challenges, the project has truly been a group effort, the Chinatown CDC working closely with architect Mithun | Solomon, general contractor Cahill Contractors, and San Francisco Fire Protection, which designed and will install fire and life-safety alarm systems. Perhaps most notable, though, has been the nonprofit’s work with federal, state, and local governments to obtain financing. The organization obtained capital from the sale of federal housing-tax credits, which are awarded to developers of qualified projects. It also received loans from the City and the County of San Francisco and the state’s Multifamily Housing Program, and it earned a grant from the Federal Home Loan Banks’ Affordable Housing Program, one of the largest private sources of grant funds for affordable housing. “Housing isn’t our only mission, but it’s a big part of our mission,” Jones says. The Chinatown district is already packed—with 15,000 residents living in just 20 square blocks—so Broadway-Sansome’s developers had to address the challenge of fitting their building to a narrow, sloped site. Site plan: Mithun|Solomon, initiated as WRT/Solomon ETC.